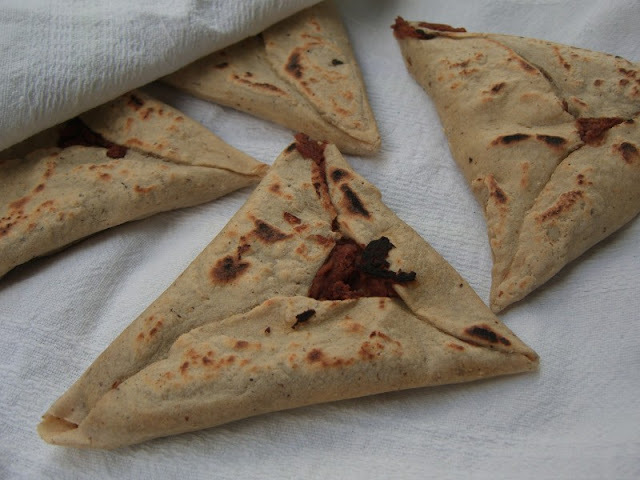 Creating these little bean filled triangles was a lot of fun. I think these were my favorite dish at our Oaxacan cooking class (and not just because I helped cook them). The first step was preparing the savory filling. 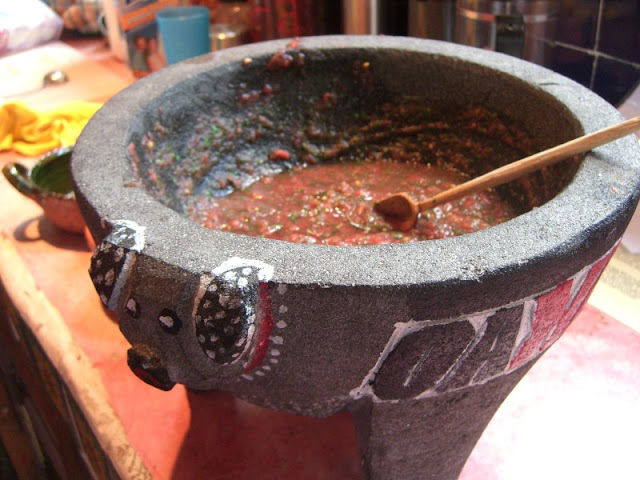 We toasted some costeño chiles, removed the seeds and then blended them along with cooked beans, garlic, onion and salt until we had a smooth puree. 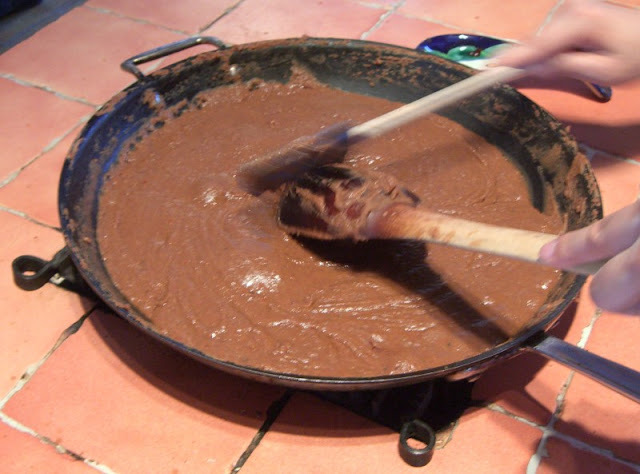 The resulting mixture was slowly fried with a little oil and until it turned into a thick, spreadable paste. 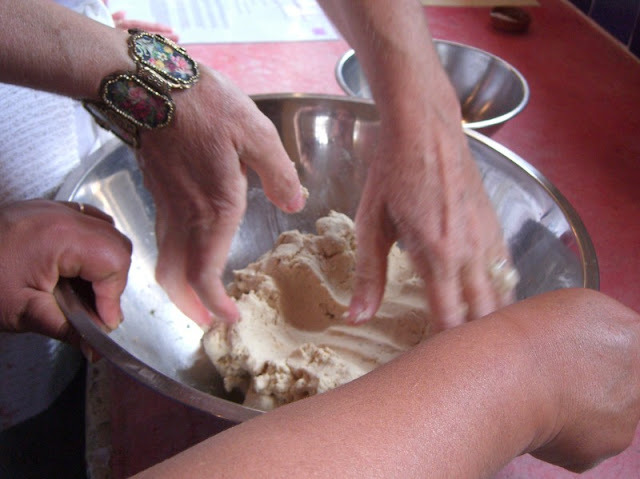 While the filling cooled we kneaded some masa with water until very soft and slightly sticky. 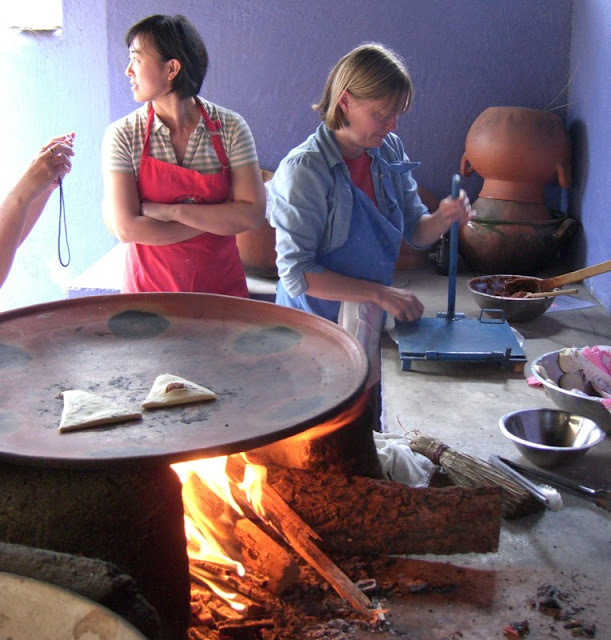 Outside by the fire, we used a tortilla press to flatten the masa into - you guessed it - tortilla shapes. We spread a layer of beans on each one and then carefully folded up the edges to make the triangular shaped packets. Apparently it is traditional to leave a little "window" in the center where the beans peek out. 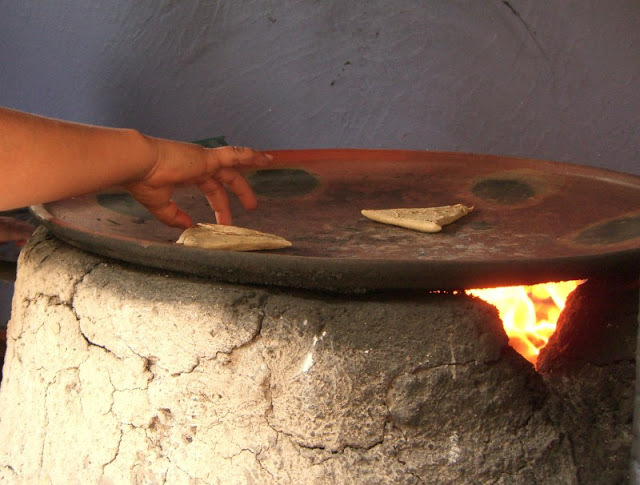 We toasted the tetelas on the comal over a hot fire until the masa was cooked and the beans nicely warmed - you need heat-resistant fingers for this job. Finally, each one was served with a spoonful of Salsa de Chilito Verde - a very spicy fresh salsa made with comal-roasted tomatoes, onion, garlic and small, green, bravo chiles all pounded together in a stone molcajete (I saw these for sale at the market, but decided a nice large one would be a bit too heavy to fit in my suitcase). I loved this combination of toasty corn masa wrapped around savory, slightly spicy beans. Along with the salsa, this is finger food at its best. You all are killing us here in Atlanta. So, do my wife and I need to go to this cooking school for our next big trip? Your pics are fantastic. We are very jealous yet very happy for you. Hi Rowdy, Yeah we had good restaurant food in Oaxaca, but that day with Susana was the highlight of our stay (for me at least). I highly recommend it as a focus for a trip to the area.